It gets mighty hot and humid in Texas. It's no wonder, then, that there are plenty of water parks. Among the most noteworthy spots to find wet fun and seek relief in the Lone Star State is Schlitterbahn. The place with the funny name (it means "slippery slope" in German) is one of the most popular, largest, and innovative water parks—not just in Texas, but around the world. The original New Braunfels location is so successful, its owners have built other Schlitterbahn parks in other parts of the state. Another well regarded water park is Aquatica at SeaWorld San Antonio. It features a lush tropical theme along with animal exhibits. As in other parts of the country, indoor water parks have caught on in Texas. There are a number of resorts that offer year-round sliding and wave pooling. The following water parks are arranged alphabetically. The large outdoor water park requires separate admission from SeaWorld San Antonio. The highly themed Aquatica includes live animals, tube slides, body slides, family raft rides, a wave pool, an activity pool, a lazy river, an interactive water play center, and play areas for younger kids. Bahama Beach is a medium-sized water park with a decent collection of water slides, including the Bermuda Triangle tower with three body slides, Riptide Slide and Bahama Bullet, slides you can ride in single- or two-passenger tubes, and Tortuga Express, a multi-lane mat racing ride. Bedford Splash is a small, municipal, outdoor water park with a bowl slide, a tot pool, an interactive water play structure, a zero-entry pool, and a few other attractions. Castaway Cove is a good-sized outdoor water park that offers a nice mix of attractions including Cliffhanger, a half pipe slide, the Storm Watch Tower with open and enclosed tube slides, the Buccaneer Bay interactive water play center, a lazy river, a wave pool, water volleyball, and activities for younger children. Epic Waters is a large, indoor water park that is open year round. Attractions include 11 water slides, a wave pool, an activity pool, a FlowRider surf simulator, a lazy river, and an arcade. The indoor water park resort, Great Wolf Lodge is open to registered hotel guests only. Day passes are not available. At 80,000 square feet, the water park is quite large and offers plenty of attractions including a bowl slide, a funnel ride, wave pool, activity pool, lazy river, two whirlpool spas, and an interactive play structure with tipping bucket. The large resort offers a host of other family activities as well. Attractions vary by location at the chain of medium-sized parks, but all of the Hawaiian Falls offer plenty of thrills as well as more sedate attractions and activities for younger children. 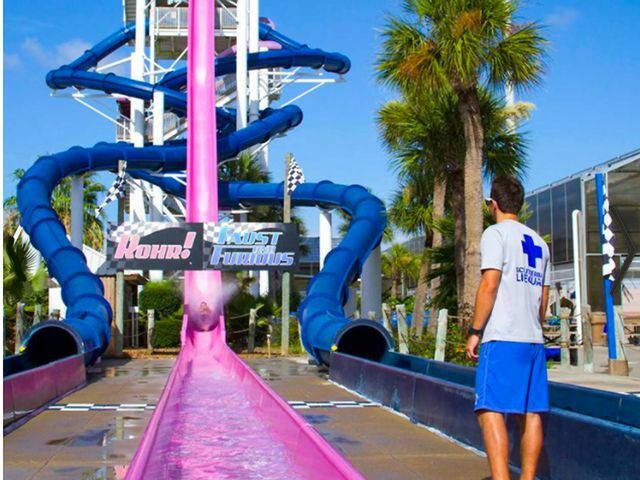 Hurricane Alley is a medium-sized outdoor park offers a lazy river, wave pool, mat-racing speed slide, interactive water play center, tube slides, body slides, and a spray deck. Water Rampage is a small outdoor water park. Attractions include Rio Rampage lazy river, Tidal Wave wave pool, Twin Twisters slides, and Dolphin Cove kids' area. NRH2O (cute name!) is a large outdoor water park that offers lots of rides and attractions including body slides, a launch capsule slide, a water coaster, a mat racing slide, a lazy river, a huge wave pool, and an interactive water play center. Outdoor and indoor water parks with locations in South Padre Island, Corpus Christi, Galveston Island, and the original, flagship Schlitterbahn in New Braunfels. The New Braunfels Schlitterbahn is one of the industry's oldest water parks in the nation and around the world. With its onsite accommodations, the huge park is as much a destination resort as a place to visit for a day trip. The family that operates the parks has developed many water park innovations, including the uphill water coaster and the FlowRider surfing attraction. Hurricane Harbor is an enormous outdoor water park located next to Six Flags Over Texas, but it requires a separate admission from the amusement park. Attractions include a funnel ride, a surf riding attraction with simulated waves, interactive kids' water play area, wave pool, tube slides, an activity pool, body slides, speed slides, a family raft ride, a lazy river, a bowl ride, two half pipe rides, and a mat racing slide. Splash Kingdom is a chain of medium-sized outdoor water parks that offer a variety of attractions which vary by location. Splashtown is a medium-sized park that offers a lazy river, wave pool, and a good collection of body and tube slides. It also presents occasional concerts, contests, and special events, such as nighttime “Dive In” movies during which family films are shown on a screen in front of the wave pool. Splashway is a large water park that includes kiddie areas, speed slides, a wave pool, mat racers, tube slides, and a lazy river. It also offers a campground. Typhoon Texas is good-sized outdoor water park with lots of slides and rides including body slides, tube slides, the Tidal Wave Bay wave pool, the Lazy-T lazy river, and the Dueling Dalton Aqua Loop slide with a launch chamber. Waterpark at The Villages is a small indoor water park that is open to members of the Silverleaf community. Attractions include a small wave pool, a lazy river, four water slides, and an interactive water play station with a dump bucket. This is a huge outdoor water park with a large number of attractions including a FlowRider surfing attraction, the Big Kahuna family raft ride, the Brain Drain slide complex with launch chambers, the Big Spin bowl rides, the Tornado funnel ride, and the Texas Freefall speed slide. Wet-N-Wild Waterworld is a large outdoor water park. Attractions include body slides, tube slides, a speed slide, the Wild Island wave pool, a lazy river, and activities for younger kids. White Water Bay is a huge water park that is included with admission to Six Flags Fiesta Texas. Attractions include two interactive water play structures, the Tornado funnel slide, a lazy river, a giant wave pool, and multiple tube and body slides.